Tungsten Market size was estimated over USD 3.5 billion in 2017 and the industry will grow by a CAGR of around 8% up to 2025. 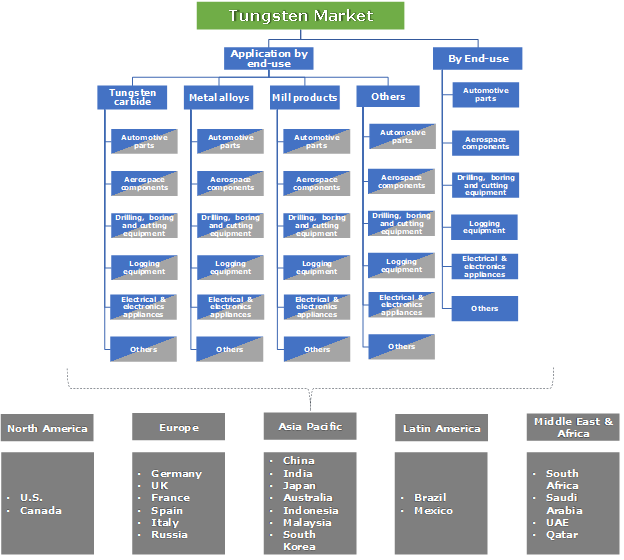 The global tungsten market will be chiefly augmented by the increasing product in different end-user industries such as automotive, aerospace, defense, electronics, oil & gas, mining, etc. Majority of the product is used in manufacturing cemented carbides or hard metals. These are materials made by cementing tungsten carbide grains in a binder matrix of a tough nickel or cobalt alloy using the process of sintering. Tungsten carbide is the most popularly used form of the product which has hardness close to diamond. It is denser than steel and titanium, twice as hard as any steel grade, and has extremely high wear resistant. Due to these characteristics, the product is widely used in construction, mining, and metalworking applications. The mining sector is a key end-user for the product, especially for carbides. Numerous industries worldwide depend on the supply of commodities from the mining sector. The top 40 companies, which represent a vast majority of the global mining industry, generated around USD 600 billion of revenue in 2017. This would increase the demand for tungsten carbide because it is widely used in the mining industry in manufacturing top hammer rock drill bits, roller-cutters, downhole hammers, raise boring reamers, long wall shearer picks, long wall plough chisels, tunnel boring machines, etc. With increasing demand for precious metals in China and other developing countries, the global mining industry is likely to maintain an upward trend in coming years and will propel the tungsten market growth. The tungsten market may face challenges from the huge demand-supply gap over the past years, causing a significant drop in the product prices since 2014. This led to a fall in the global market size in terms of revenue, and the manufacturers underwent losses in order to balance the demand-supply dynamics. Though, the prices stabilized after 2016, leading to a rise in the market size, the level of uncertainty may pose hindrances in the tungsten market growth over the coming years. 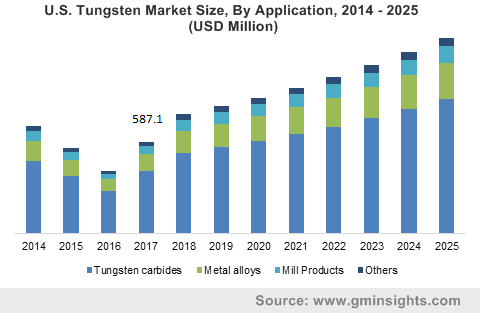 Based on application, global tungsten market has been segmented into tungsten carbide, metal alloys, mill products, and other applications such as salts, tungstates, sulfides, oxides, etc. Carbide is the largest application segment and is likely to grow with a CAGR of around 8% during the forecast period. Increasing usage of these products as drilling, boring, and cutting tools in various industries will drive its market. Mill products tungsten market application segment accounted for around one-tenth of the overall market. The segment’s demand is likely to grow by more than 7% from 2018 to 2025. Mill products are pure tungsten metal products such as electrodes, lighting filaments, electrical & electronic contacts, sheets, wires, rods, etc. Developments in the electronics industry will be the major factor driving the mill tungsten market growth during the forecast period. Based on end-use, the global tungsten market is segmented as automotive parts, aerospace components, drilling, boring & cutting equipment, logging equipment, electrical & electronics appliances, and other end-uses including chemical, defense equipment, etc. Drilling, boring and cutting equipment is a major end-use sector in the product market. The segment will gain by around 8% CAGR during the forecast period. These equipments are used in mining, construction, oil & gas, and metalworking industries. Aerospace components is also an important tungsten market end-use sector which is poised to grow by more than 7% CAGR during the forecast period. The product is extensively used in manufacturing aerospace components such as rotor blades, propellers, inertial systems, fluid control systems, bucking bars, trim weights, aircrafts balance weights, and many more. Asia Pacific is the largest tungsten market in the globe accounting for more than half of the product demand in 2017 and poised to grow by more than 8% CAGR. The regional industry will be chiefly driven by China, which is the largest producer as well as consumer of the product. High growth in China’s automotive, aerospace, mining, and electronics sector will be the major factor behind its dominant market position. North America is also a key tungsten market in the world which will grow by a CAGR of around 7% from 2018 to 2025. Developments in the country’s automotive, aerospace & defense, and oil & gas industry will propel the product industry growth in coming years. Latin America and Middle East & Africa regions have much lower product demand when compared with other regions. However, these regions will have a high industry growth rate during the forecast period. Some of the key players in the tungsten market includes Xiamen Tungsten Company, China Minmetals Corporation, Chongyi ZhangYuan Tungsten Company, Global Tungsten & Powders Corporation, Wolfram Bergbau-und Hutten AG, H.C. Starck, Guangdong Xianglu Tungsten Company, Japan New Metals Company, Soloro, Specialty Metals Resources SA, Wolfram Company JSC, and W Resource. Most of the companies in the market are integrated across the value chain and are involved in raw material production, processing as well as manufacturing of finished products. Since its discovery in the middle ages, tungsten or wolfram has been used by humans for a wide range of applications. The tungsten market makes an important contribution to a country’s economy, through its use in high-speed steel tools and cemented carbide, and by helping to achieve high productivity levels in manufacturing industries. It is used in lighting technology, electronics, power engineering, automotive & aerospace sectors, coating & joining technology, medical technology, and many other important industries worldwide.